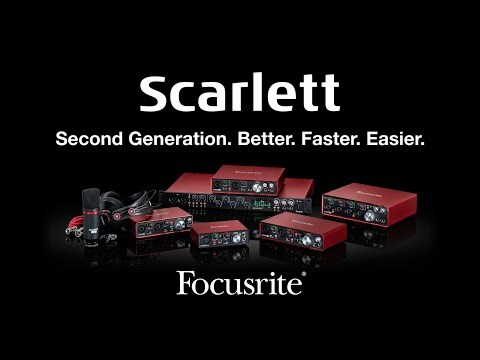 A great introduction to recording for those who want a simple set up that just works, the Focusrite Scarlett 2i2 Second generation is a 2-in/2-out USB Audio Interface that is compatible with both Mac and PC, offers 24-bit resolution at sample rates of up to 96 KHz, houses two high-quality, award-winning microphone preamps, and is protected by a distinctive, red, anodised aluminium unibody chassis. The interface offers two channels, so you can capture from two sources simultaneously and from a variety of sources, thanks to the two XLR/¼” TRS jack combo inputs, which will accept audio from microphones, instruments or line-level devices, the switching of which is easy with independent Line/Instrument switches for each channel. There is also a 48V Phantom Power switch so you are not restricted in your choice of microphone. Both channels have their own Gain controls, which are circled with 'halo' indicators. These halos light up red when your input level is too high and is clipping, so that you know to alter the amount of gain. Once lowered a sufficient amount the halo will go to amber and then green. The Second Generation Focusrite Scarlett 2i2 USB Audio Interface’s output section is quite simple. A USB connection takes your signal to the computer and also provides bus-power to the unit (so you don’t need a power supply), and two balanced, ¼” TRS jacks and a ¼” TRS jack positioned on the front, provide monitoring options for either speakers or headphones. The monitoring section also offers a level control and a separate headphone amp, with the option of direct hardware monitoring of the inputs for low-latency monitoring. The Focusrite Scarlett 2i2 second generation USB interface comes with a plethora of powerful software including Softube Time & Tone Pack, Pro Tools First / First Focusrite Creative Pack, Ableton Live Lite music making software, 2 GB of Loopmasters sounds and samples and the Novation Bass Station VST and AU plug-in synthesiser! A huge collection for you to get creative with. Also included are these accurate models of Focusrite’s renowned classics the Red 2 equaliser and Red 3 compressor units which are prized and renowned fixtures in professional recording studios the world over. Now, the Red 2 & Red 3 Plug-in Suite lets you exploit the famous natural sound of the originals conveniently from within your DAW of choice including Cubase, Ableton, Logic and Pro Tools. The plug-ins faithfully reproduce the sonic qualities of the hardware. The Red 2 EQ is a sweet sounding 6-band design, with high/low pass filters,high/low frequency shelves, as well as fully parametric low-mid and high-mid frequency bands. The Red 3 compressor is a VCA compressor design, excellent for natural sounding dynamic control of drums, bass, vocals, and acoustic instruments. The Focusrite Scarlett 2i2 Second Generation USB Audio Interface represents astonishing value for money and comes guaranteed with professional clarity that will bring your recordings to life.